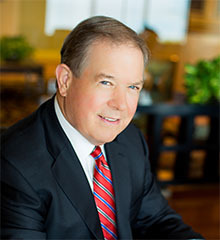 Rick Thomas is Chief Executive Officer of Thomas Financial, which he founded in 1975. His firm focuses on estate planning and wealth transfer for high net worth individuals and firms as well as business continuation and executive benefits for both the public and private sectors. Rick is a Qualifying and Life Member of the Million Dollar Round Table (MDRT) Top of the Table. He began his career with Protective Life Insurance Company at age 22 and qualified for MDRT after six months in the industry. In 1977, he became a Charter Member of the Top of the Table and is the youngest worldwide Charter Member to have qualified every year since inception. Rick has been a member of the Association of Advanced Life Underwriting (AALU) since 1978 and is a Platinum Level Qualifier of the Legislative Circle Program, in which he has participated for 22 years. He is a member of the Society of Financial Service Professionals and the Tampa Bay Estate Planning Council. Rick has participated in numerous speaking engagements for the insurance industry on a local and national level. Besides being a frequent speaker at M Meetings, he has addressed the Million Dollar Round Table, the Top of the Table, the International Forum and local insurance associations. Rick is Chairman Emeritus of the Board of Trustees of the University of Tampa, his alma mater, and currently serves on the Advisory Board at the university’s John Sykes College of Business. He is also a member of the Board of Directors of the Outback Steakhouse Inc. Community Foundation and is involved in many civic and charitable organizations. Rick is a graduate of the University of Tampa, where he earned a Bachelor of Science degree in Business Administration in 1972. His CLU® designation was received from the American College in 1975.